Enumeration constants (srfGridFmtXYZ) are not working in Scripter. How can I reference the Surfer type library? When the enumeration constants are not working or causing errors, it is usually because the Surfer type library is not referenced. 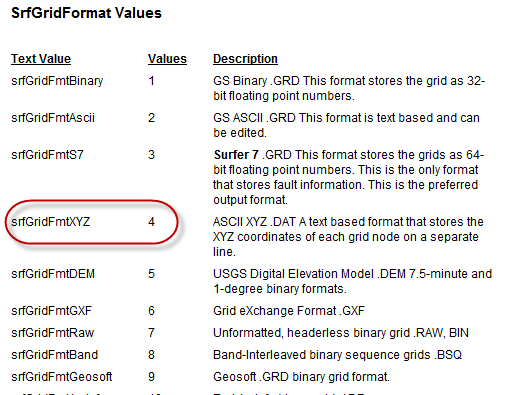 This reference is needed for a program to recognize the value of the enumeration constants (such as srfGridFmtXYZ) that Surfer uses to reference various settings. You can either reference the type library, or you can use the actual value of the constants in the commands instead of the enumeration constants (use 4 instead of srfGridFmtXYZ). The Surfer Scripter program and the Microsoft VBA that comes with Word and Excel use the Edit | References menu command to add a reference to a program's type library. type is a "long" or 32-bit integer value. 3. You can also use the Debug | Browse menu command in Scripter to display the value and the related enumeration constants. Display the value of an enumeration constant with the Debug | Browse menu command in Surfer Scripter.